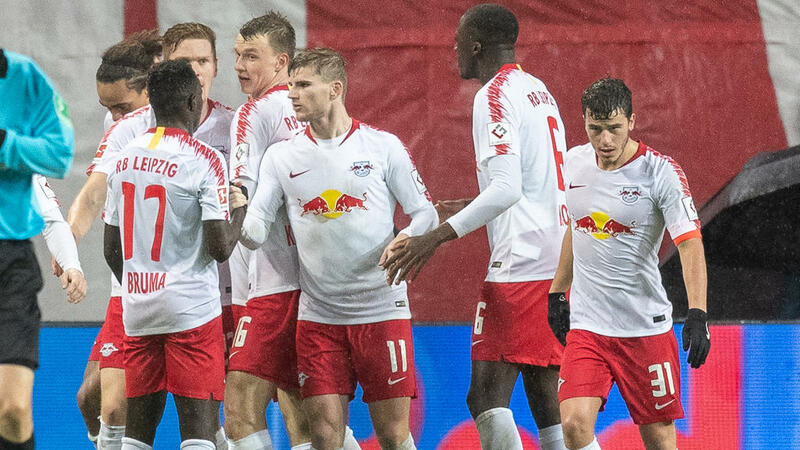 Timo Werner netted twice as RB Leipzig climbed to third in the Bundesliga on Sunday with a 2-0 win over Borussia Moenchengladbach which left leaders Borussia Dortmund seven points clear. After three straight wins, second-placed Gladbach crashed at the Red Bull Arena as Leipzig dominated with Germany striker Werner netting both goals in the first-half to leave him with eight league goals so far this season. "It was a lot of fun," Werner told Sky as Leipzig bounced back from last weekend's shock defeat to Wolfsburg and loss at sister club Red Bull Salzburg on Thursday in the Europa League. "When we play like we did today, everything is possible - not just for me, but for the whole team," he added with Leipzig facing strugglers Freiburg and Mainz before a mouth-watering clash at Bayern Munich on December 19. Leipzig's win pushes defending Bundesliga champions Bayern, who won 2-1 at Werder Bremen on Saturday, down from third to fourth. The Bavarian giants, who trail Dortmund by nine points, will drop to fifth if Eintracht Frankfurt beat Wolfsburg at home on Sunday evening. Leipzig's victory left Dortmund with a commanding lead in the table after their 2-0 win over Freiburg on Saturday as Paco Alcacer became the league's top-scorer with his 10th goal after Marco Reus had converted a penalty. On Sunday, Werner fired hosts Leipzig ahead after just three minutes when a long ball to Yussuf Poulsen put the Danish forward deep into Gladbach territory and he put Werner away. The 22-year-old traded passes with midfielder Marcel Sabitzer before firing home across Gladbach goalkeeper Yann Sommer for the superb opener. Gladbach's forwards Thorgan Hazard and Lars Stindl ensured Leipzig goalkeeper Peter Gulacsi had a busy afternoon to keep the visitors in the game. However, Leipzig made sure of the win when Werner finished a superb counter-attack. He laid off the ball for Poulsen and then sprinted away with the Gladbach defence in all sorts of trouble. Poulsen beat a defender and Sommer superbly in the Gladbach goal, but the ball ran loose in the box and Werner pounced to tuck it home just before the half-time whistle. Hazard hit the post with Gulasci beaten with 15 minutes left in the best second-half chance for either side, but Leipzig held on. "Of course we are disappointed," said Gladbach coach Dieter Hecking, who praised the Leipzig performance, adding "we must accept the defeat when our opponents played so well".